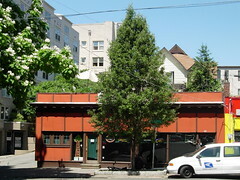 tonight's mystery: is the apparent rooftop seating at Redwood open to the general public? I plan to investigate tonight, and then go see Party Girl at cinema on the lawn. Sounds like an awesome plan, right? Let me know if you want to join the fun. update: the roofdeck is not part of the bar. it's the property of the landlord, whose house is behind the redwood. sorry if I missed you. we really misinterpreted their definition of dusk and missed at least the first half hour of the movie. that's ok. i called at about 8:30, but ended up hanging out with a friend who's in town from scotland.